Booking abandonment rates within the travel industry are at over 80 percent, according to Leonardo.com. These rates are a result of the longevity of the purchasing process involved when looking into flights, hotels and all things travel-minded. This type of planning takes up some serious time, and in our busy lives, it has become quite difficult to find that time. Travel businesses should take initiative in recovering abandoned bookings for their customers through marketing automation campaigns. Web push notifications are a new channel that you can utilize to communicate with anonymous users in an automated way, in order to bring them back to your website. They offer customer engagement, increased revenue opportunities and customer satisfaction without requiring an email address. Online travel websites are benefitting the most from the use of automated push notifications, within all other industries. 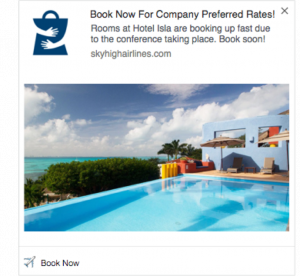 Through all stages of the booking process, companies are able to send relevant and personalized notifications that will help increase conversion rates and boost customer satisfaction in the newest and most convenient way available. 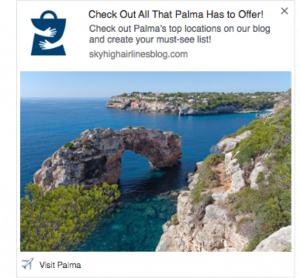 How Can Travel Sites Bring Customers Back Through Automated Push Notifications? Starting at the beginning of the purchasing process — Most users begin by researching various destinations and costs of different hotels and flights. Imagine finding a hotel or flight that is of interest to you, but the price is far too high for your liking. Instead of having to go through the hassle of monitoring that hotel or flight each day in hopes for a price drop, imagine how much easier it would be if you were alerted through a push notification regarding that specific price reduction. These notifications have the unique ability to contact users about broader sales and target people based upon their specific interests. For example, if you are running an early summer discount sale, you might target users who have previously searched for sunny destinations along the coast in order to alert them of a new or upcoming sale within that area of interest. Push notifications help trigger the beginning of the travel planning process and gives that extra push that is necessary in finalizing their decision. Cart abandonment is a major issue within the travel industry because of the longevity of the booking process. Research is a very crucial part of travel and users tend to first research many websites in order to find the best deal for them. Nearly 40 percent of users agree that they abandon a travel website simply because they are still researching other options. 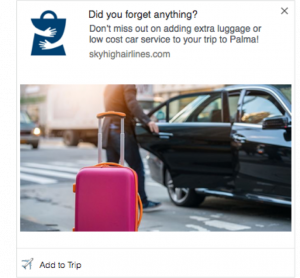 By retargeting users through push notifications, travel companies are able to remind users of what they were previously looking at and also provide recommendations to the user based upon what they formally looked at. Again, the idea is all about benefiting the customers and making the booking process easier for the user. Travel businesses should take full advantage of cross-selling because it offers opportunities to sell services such as hotel bookings and car rentals after the customer has booked their flight. In addition, in-flight services can also be offered such as preferred seating, pre-paid meals and in-flight entertainment. Cross-selling and up-selling not only project increases in revenue, but also drive consumer retention. Once your user determines their destination and books the trip, push notifications become a great communication tool bridged between the website and the user. Updates on future travel plans are notifications that users tend to find very helpful. A few push notification campaigns that would be of great contribution could be preparation alerts. Real time alerts make your user’s travel experience run smoother and increases the chances of a rebooking through your company in the future. Information featured on mediums, such as blogs, have the outreach available to share information on ideas such as popular destinations or the best restaurants in that particular area. Blog posts share attractive information on destinations and in return, excite travellers. If your site runs a blog or another source containing informative content, you will then be able to trigger push notifications pertaining to that content to users who have booked a trip to that specific destination. Not only is this drawing automatic attention and bringing more traffic to your website, but it is also offering quality content to your users who are more likely than not, to find it relevant. 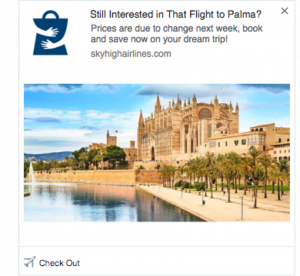 Through push notifications, it is possible to send automated suggestions regarding new destinations that your customer may like to discover based on their previous destination choices. 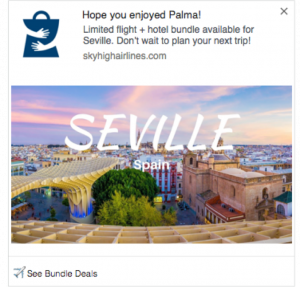 If a customer formerly purchased a flight to Palma, a suitable suggestion would be a destination such as Seville, another city located in Spain. Bringing the customer back is the ultimate goal and by suggesting new locations, you are able to spike curiosity among your consumer and in return, sending them running back to your site. Take into consideration, sending helpful tips that will help give your customers information on how to save money. This will help you to gain their business and bring the customer back instead of traveling to a competitor’s website. An example of a push notification campaign that could be put in place, could be a number of travel alerts regarding popular travel times, such as the holidays and summer. 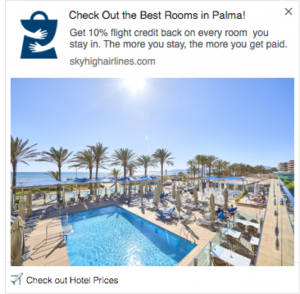 These notifications make reaching out to the user easy by informing them when flight or hotel prices are expected to rise, the cheapest days and months to travel, among other traveling tips. This encourages users who are starting the booking process to continue visiting your site and will keep your company relevant and fresh in the minds of potential customers. 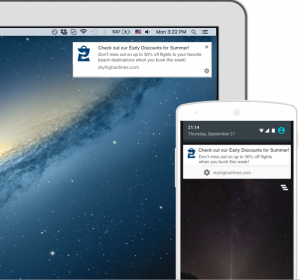 You can start utilising marketing automation through web push notifications with Frizbit now. Create an account on frizbit.com right now and start a trial on your website.